Only 500 meters can be reached the Vatican Museums and the underground station "Ottaviano – S. Pietro" to easily get to the most important touristic and cultural sights of Rome. 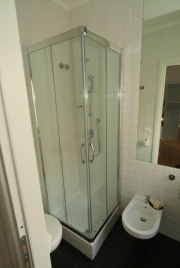 - A bathroom with shower, equipped with all facilities. Take subway train line A direction BATTISTINI (buy ticket before). 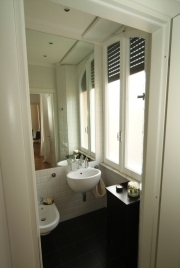 Get off at Ottaviano/San Pietro, the Suites are only 500 meters from the underground station. FROM FIUMICINO INTERNATIONAL AIRPORT "LEONARDO DA VINCI"
Take the Leonardo Express shuttle train (buy ticket before), it's a direct line, no intermediates stops, to Termini Central Station. From the Station take the subway train line A direction BATTISTINI. 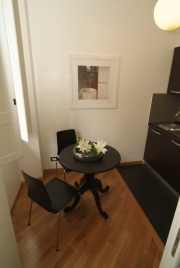 Get off at Ottaviano/San Pietro, the Suites are only 500 meters from the underground station. Take the shuttle train FM4 to Termini Central Station (buy ticket before). From the Station take the subway train line A direction BATTISTINI. 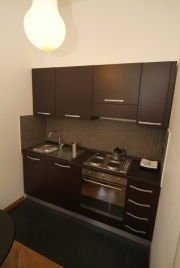 Get off at Ottaviano/San Pietro, the Suites are only 500 meters from the underground station. From highway head towards "Grande Raccordo Anulare" in the direction Aurelia/Aeroporto di Fiumicino (Fiumicino Airport). Take the exit 1 "Aurelia" direction Città del Vaticano - Roma Centro. Drive along to reach Via Baldo degli Ubaldi then take Via Angelo Emo and keep on driving until you reach Via Candia. Drive along Via Candia and at the end at the traffic lights turn left on Via Leone IV. Continue driving along Via della Giuliana and on the second street on your left you’ll find Via Buccari. The Suites are located at nr. 16. FROM HIGHWAY A1 DIRECTION NAPOLI -> ROMA From highway head towards "Grande Raccordo Anulare" in the direction Aurelia/Aeroporto di Fiumicino (Fiumicino Airport). Take the exit 1 "Aurelia" direction Città del Vaticano - Roma Centro. Drive along to reach Via Baldo degli Ubaldi then take Via Angelo Emo and keep on driving until you reach Via Candia. Drive along Via Candia and at the end at the traffic lights turn left on Via Leone IV. Continue driving along Via della Giuliana and on the second street on your left you'll find Via Buccari. The Suites are located at nr. 16.